Caitlin O’Connell-Rodwell in Etosha National Park. When it’s time to leave the waterhole, African elephant family groups have a special way of announcing their departure. 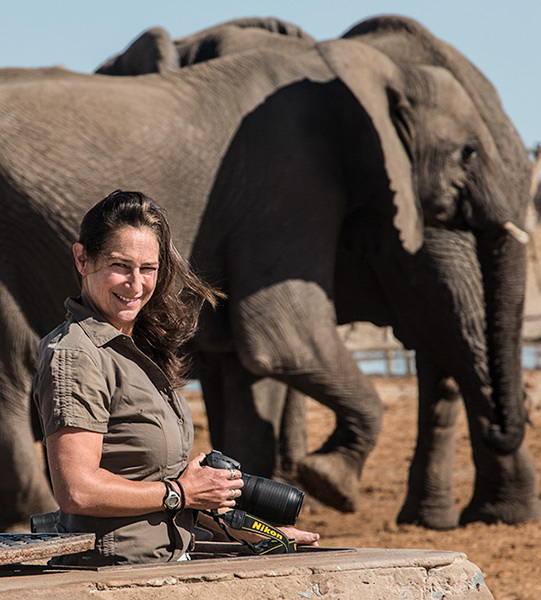 “We call it the ‘let’s go’ rumble,” explains Caitlin O’Connell-Rodwell, a Stanford University scientist who has been studying elephants in Namibia’s Etosha National Park for 20 years. First comes the low-frequency call of the matriarch, followed by a series of close or overlapping rumbles from other high-ranking females. “What you get is a call that’s at least three times the size of the original call,” O’Connell-Rodwell says. “It’s as if they need the motivation of this call to action.” Her study of these departure vocalizations recently appeared in the journal Bioacoustics. But the scope of O’Connell-Rodwell’s research is larger (one might say elephantine): Her interests extend from seismic communication to wildlife conservation to the effects of the environment on elephants’ social structure. “There are a lot of different questions we have, because elephants are long-lived social animals,” she says. “It takes years to find particular social patterns.” Hoping to learn as much as possible about the elephants without disturbing them, O’Connell-Rodwell and her colleagues have set up a solar-powered camp at Mushara waterhole. Studying waterhole behavior, O’Connell-Rodwell found that elephants form linear dominance hierarchies in years with low rainfall. “When there are minimal resources, you have to have more order to prevent chaos,” she says. “Everyone knows where they stand, so there is less fighting and less stress.” Acts of affiliation, like the trunk-in-mouth described above, are more common than aggression. When male elephants break out of the protected borders of the Etosha National Park, they often wind up in places where they’re unwanted. This puts them at risk of getting shot by humans. Concerned about the conservation of this sensitive species, O’Connell-Rodwell has experimented with one promising way of getting bulls to return: broadcasting a recording of an estrus call. Click here to watch a video of a bull responding with impressive urgency to an estrus-call playback. As her article explains, elephants produce powerful, low frequency vocalizations that “couple with the ground and travel along the surface of the earth with a separate velocity than their airborne counterparts.” Several aspects of elephants’ anatomy, from their fat-covered feet to the sinuses in their skulls, may help them detect these vibrations. They also seem able to discriminate between different seismic signals, responding with greater vigilance to alarm calls from familiar elephants. Based on what she’s learned from elephant communication, O’Connell-Rodwell is working to develop a vibrotactile hearing aid for humans. Field camp at Etosha National Park. Elephants may stomp around, but they are easily disturbed by human activity. This past summer, O’Connell-Rodwell and her colleagues set up a solar-powered research camp at the Mushara waterhole, enabling them to study and videotape the elephants unobtrusively. 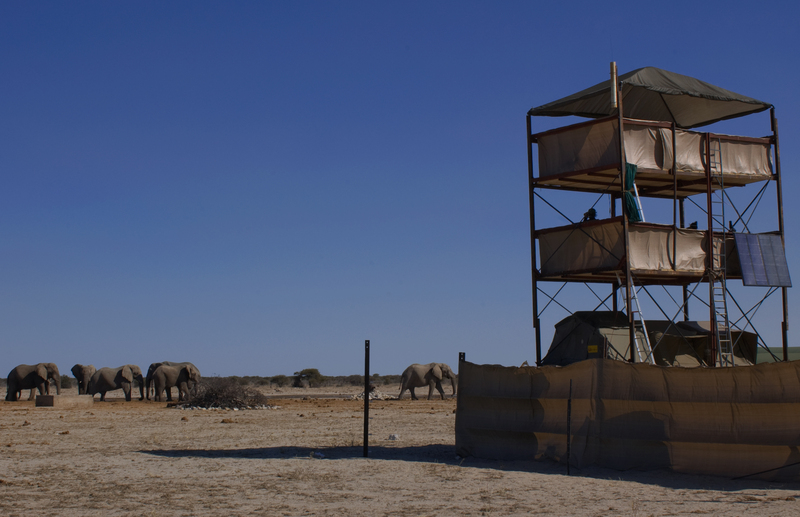 This entry was posted in Biology, Conservation, Elephants, Elephants and tagged biology, conservation, dominance hierarchies, elephants, Etosha National Park, research, science, seismic communication, social structure, solar field camp by Susan Frith. Bookmark the permalink.